Crepe Delicious: Considering to Buy Healthy Food Franchise? If you want to change things up, embark on a new career path, and be your own boss, consider opening your own franchise. Healthy food franchises have been steadily gaining popularity over the last several years. This trend shows no sign of slowing down, as more and more people make health-conscious dining choices and look for fast food that provides tasty and healthy menu options. Crepe Delicious provides a developed business model, ongoing guidance, systems and assistance in exchange for periodic fees or purchases. While these are expenses you would not face as an independent business owner, they come with a great deal of resources, expertise and a network of professionals to support you. Instead of paying for costly mistakes as a first-time business owner, pay a franchiser to guide you towards ongoing profitability. Independence: You don’t have to go it alone to fulfill your dreams of being a small business owner. Franchises offer the independence and control of small business ownership with the benefits of being part of a big business network. No Experience Necessary: Don’t hesitate just because you are new to the food industry or don’t have a business background. You don’t necessarily need business experience to run a franchise. Crepe Delicious can help provide the training you need to operate our business model. Better Odds: Franchises have a higher rate of success than start-up businesses. With an existing customer-base and brand recognition, you can hit the ground running when you open your doors for business. Easier Financing: You may find it easier to secure financing for a franchise. Plus, it can cost less to buy a franchise than to start your own business, even if it is in the same industry. Brand Recognition: Finding your audience and building a brand from scratch can be an uphill battle. Franchises often have an established reputation and image, with trust from customers built over years. Proven management and work practices make the transition easier. Plus, you’ll have access to national advertising campaigns and ongoing support. Support Systems: You will enjoy a network of other franchise owners and support from upper management. You will get assistance through every stage of the process. From site selection to lease negotiation, through site development, builders and shop fitters. You will also have access to assistance with outlet design and equipment purchasing. If you are looking to start your own business in a profitable industry with an existing support structure, a food franchise may be right for you. 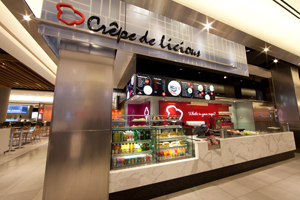 Crepe Delicious offers franchise owners with guidance while providing customers with healthy alternatives to other fast food options. Find a rewarding career you can feel good about by feeding patrons well and running your own business profitably.